Twenty-five years ago, on December 21, 1988, Pan Am Flight 103 exploded over Lockerbie, Scotland, killing all 259 people on board and 11 people in the town. Helen Engelhardt's husband, Tony Hawkins, was on that flight. Engelhardt is a writer, poet, storyteller, and independent audio artist; hearing her describe the year that followed her husband's loss is a powerful listening experience. The Longest Night is a unique audio memoir. It is more than one woman's experience. It weaves conversations recorded at the time with family and friends. 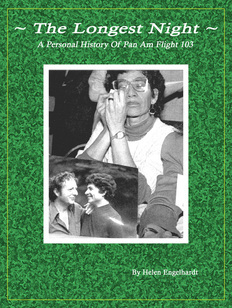 Engelhardt recounts how she connected with other shattered families as they created an effective political and emotional support group, "The Victims Of Pan Am Flight 103." Residents of Lockerbie describe the impact of that night on their lives. At the heart of the memoir is the story of the love and marriage of Engelhardt and Hawkins. The Longest Night is based upon Helen Engelhardt's memoir of the same name. It was directed by award winning audio book producer Jeffrey Hedquist. Engineering and Sound Design by David Shinn. Helen Engelhardt, a gifted writer and story teller, has brought us, with The Longest Night, an eye and heart witness account of a harrowing moment in our collective history. This is the story of her beloved husband who through accidents and quirks of fate decided to board Pan Am Flight 103. Neither he nor anyone else who made the same decision survived the terrorist bomb that was to send them hurtling through the sky to unsuspecting earth in Scotland. In these times, the oral tradition begins to take back its rightful place as a vehicle for recording history, instilling values, teaching lessons, focusing attention, providing diversion, and creating community. Engelhardt is a leading star in this revival.